Most people assume the palm-lined, sun-splashed islands of the Caribbean—though nice for vacation—are too expensive to live on. But a new InternationalLiving.com report points to five great-value Caribbean retreats ideal for an affordable retirement… as well as two islands to avoid. There exist islands that boast the same turquoise-blue waters and powder-white beaches the Caribbean is known for, only it doesn’t cost a fortune to live on any of them. They’re great for vacation... but most people assume Caribbean islands are simply too expensive to actually live on. That’s not necessarily the case, however. According to a new report from the retire-overseas experts at InternationalLiving.com, beyond the mass-market shores the tourist brochures describe—off the Caribbean coasts of Belize, Nicaragua, Honduras, and Mexico—there exist islands that boast the same turquoise-blue waters and powder-white beaches the Caribbean is known for, only it doesn’t cost a fortune to live on any of them. The International Living report details five Caribbean islands that won’t break the bank…and two that just might. English-speaking Ambergris Caye is the largest island in Belize at 25 miles long and a little over a mile wide. San Pedro is its only town. About 30 years ago, Ambergris became a hotspot for divers and fishermen, thanks to the Belize Barrier Reef, just a half-mile offshore. This natural wonderland of living coral supports a dizzying array of marine life, and it’s the main reason Ambergris has seen its recent (and significant) growth. Expats give up little living on Ambergris Caye. Power, water, cell phone coverage, and internet are reliable…and you can buy most necessities for daily living on the island. Expats who live on the island report a cost of living, including rent, of $2,000 to $3,000 a month and properties can be found from around $175,000. Roatán has quietly graduated from secret divers’ getaway to livable island haven. Just 50 square miles, this green, hilly island off Honduras’ northern coast is long and skinny, fringed by a reef rich with sea life and garnished by white-sand beaches. The beaches here are quiet and pristine. Life is laidback, lived in rhythm with the sun and the surf. No big-name resorts. No “spring break” strips. No high-rise developments. Roatan is old-school Caribbean…though fitted out with modern conveniences. English is widely spoken. That, along with an established expat community, makes it a relatively easy place to settle in. Life on an island is often more expensive than mainland living—almost everything has to be imported, after all. But relative to the rest of the Caribbean, Roatán offers excellent value…the monthly cost of living for a couple, including rent, is $2,000 to $2,500. A couple can live a very nice life on Isla Mujeres for around $2,500 a month, including rent. Rents range from $900 to $1,500 for one- or two-bedroom apartments and groceries for a couple typically total around $600 a month. The Dominican Republic has great weather and world-class beaches, not to mention a low cost of living and a stable government—plus it’s just three-and-a-half hours from New York, which means it’s possible to leave the city in the morning and be on the beach for lunch. The town of Las Terrenas offers excellent values with its combination of beautiful beaches, a small-town feel, chic style, and relatively affordable property. Thirty years ago, it was a rustic fishing village. Twenty-four years ago, the town didn’t have an electricity supply. But an influx of 6,000 French and Italians, who loved this place so much they decided to settle here, changed the face of the town. This isn’t all-inclusive-resort territory, and thanks to strict planning laws, it should stay that way. The beach hotels here are small and family-run rather than sprawling, faceless chains. The beaches around Las Terrenas are some of the most pristine in the Dominican Republic. Everything included, a couple can live in this tropical haven for around $2,000 a month, including rent (though most choose to spend closer to $3,000 a month). Real estate in Las Terrenas remains affordable. Newer condos, close to shops and a 15-minute walk to the beach, start at $100,000. Just 50 miles off Nicaragua’s Caribbean coast, the Corn Islands aren’t for everyone. Supplies that aren’t locally grown or pulled from the waters must be shipped in. With small exception, restaurants all tend to serve variations of the same dishes. But the vibe is laidback Caribbean island in the extreme. 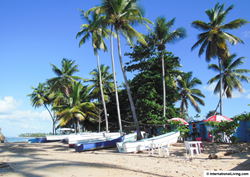 Big Corn Island is about four square miles in size and has about 6,000 inhabitants. It’s just 10 miles (or a wild 30-minute boat ride) from Little Corn, one-fourth the size of Big Corn in both land mass and population. On Little Corn, there are no roads, just a three-foot-wide sandy walkway…so no vehicles allowed. Real estate is coming into its own here, but there are still plenty of deals to be had. On Big Corn, for example, an ocean view, two-bedroom home a two-minute walk to the beach recently listed for $150,000. The appeal of these tropical islands is the mixture of the exotic and the recognizable—an island paradise with modern comforts and a balance of Caribbean culture and American practicality. But while St. Thomas may be a nice place to live, apartments rent for about $2,000 a month, and to buy a two-bedroom house in a good neighborhood will cost about $225,000-plus. The International Living report contains more information on cost of living and other details about the five affordable Caribbean island retirement destinations. Find the latest International Living report at: 5 Affordable Caribbean Islands To Live On...And 2 To Avoid. Editor's Note: Members of the media have permission to reproduce the article linked above once credit is given to InternationalLiving.com. For 36 years, InternationalLiving.com has been the leading authority for anyone looking for global retirement or relocation opportunities. Through its monthly magazine and related e-letters, extensive website, podcasts, online bookstore, and events held around the world, InternationalLiving.com provides information and services to help its readers live better, travel farther, have more fun, save more money, and find better business opportunities when they expand their world beyond their own shores. InternationalLiving.com has more than 200 correspondents traveling the globe, investigating the best opportunities for travel, retirement, real estate, and investment.